The world's tech giants are at the centre of controversies over fake news, free speech and hate speech on platforms where influence is bought and sold. Yet, at the outset, almost everyone thought the internet would be a positive, democratic force, a space where knowledge could be freely shared to enable everyone to make better-informed decisions. How did it all go so wrong? 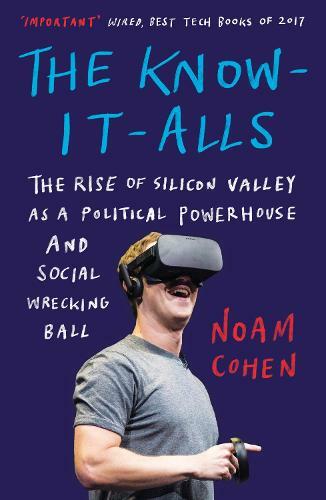 Noam Cohen reports on the tech libertarians of Silicon Valley, from the self-proclaimed geniuses Jeff Bezos, Peter Thiel, Reid Hoffman and Mark Zuckerberg to the early pioneers at Stanford University, who have not only made the internet what it is today but reshaped society in the process. It is the story of how the greed, bias and prejudice of one neighbourhood is fracturing the Western world. `Why is the Internet the way it is? How has commerce come to dominate the scramble for clicks and eyeballs? What kind of people, essentially all of them young men - brainy, ambitious, focused, very young men - created cyberspace? Via the careers of a dozen of them, Noam Cohen tells the story in this entertaining, refreshingly unworshipful survey.' -- Hendrik Hertzberg, author of Politics: Observations & Arguments and !Obamanos!